AIR PROTOTYPING 36 February/March 2018 unmanned systems inside The new DunkWorks at Massachusetts's Center for Marine Robotics is not just a unique maker space for advanced prototyping; it is a window into the future of 3-D manufacturing and the potential of automated systems engineering. And, now, you won't have to be working on Center marine projects to use it. by Dee Ann Divis Photos courtesy of Woods Hole Oceanographic Institution and Dee Ann Divis. R apid prototyping can greatly improve the odds of success for new products by shortening development time and lim- iting effort spent on dead-end ideas. The faster firms can perfect a new device, even to the point of having potential users try it out and suggest changes, the faster inventors will be able to se- cure new funding and get to the next step. Now a broader range of innovators will have access to a unique facility on Massachusetts' Cape Cod designed to help them do exactly that. The Center for Marine Robotics (CMR) has completed its DunkWorks and is opening it to external users. 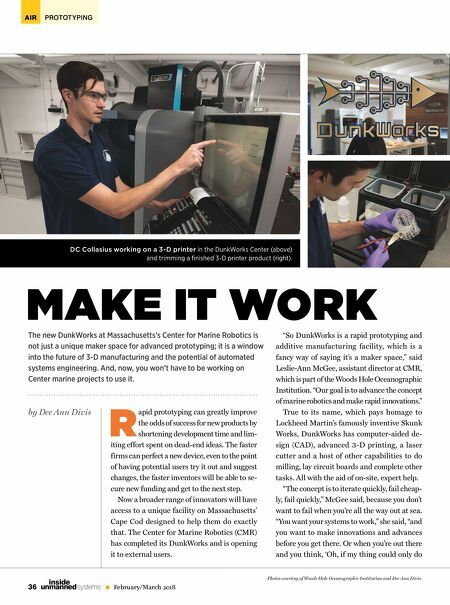 "So DunkWorks is a rapid prototyping and additive manufacturing facility, which is a fancy way of saying it's a maker space," said Leslie-Ann McGee, assistant director at CMR, which is part of the Woods Hole Oceanographic Institution. "Our goal is to advance the concept of marine robotics and make rapid innovations." 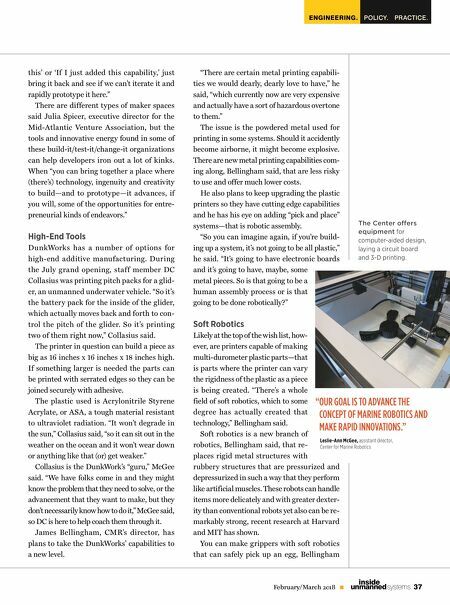 True to its name, which pays homage to Lockheed Martin's famously inventive Skunk Works, DunkWorks has computer-aided de- sign (CAD), advanced 3-D printing, a laser cutter and a host of other capabilities to do milling, lay circuit boards and complete other tasks. All with the aid of on-site, expert help. "The concept is to iterate quickly, fail cheap- ly, fail quickly," McGee said, because you don't want to fail when you're all the way out at sea. "You want your systems to work," she said, "and you want to make innovations and advances before you get there. Or when you're out there and you think, 'Oh, if my thing could only do MAKE IT WORK DC Collasius working on a 3-D printer in the DunkWorks Center (above) and trimming a finished 3-D printer product (right).